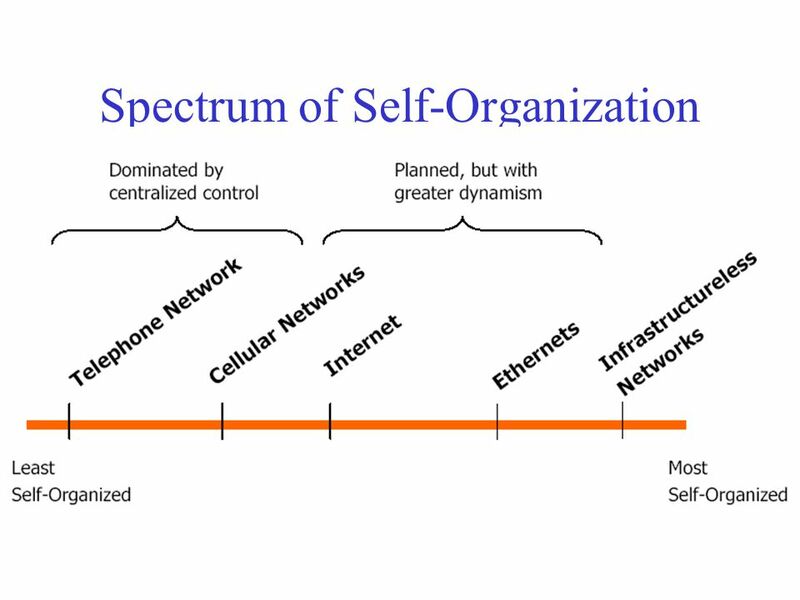 10 Self-Organization A self-organized network is an independent collection of nodes in which enough information—or the ability to retrieve such information--is present in order to allow transfer of information between any two nodes in the network. 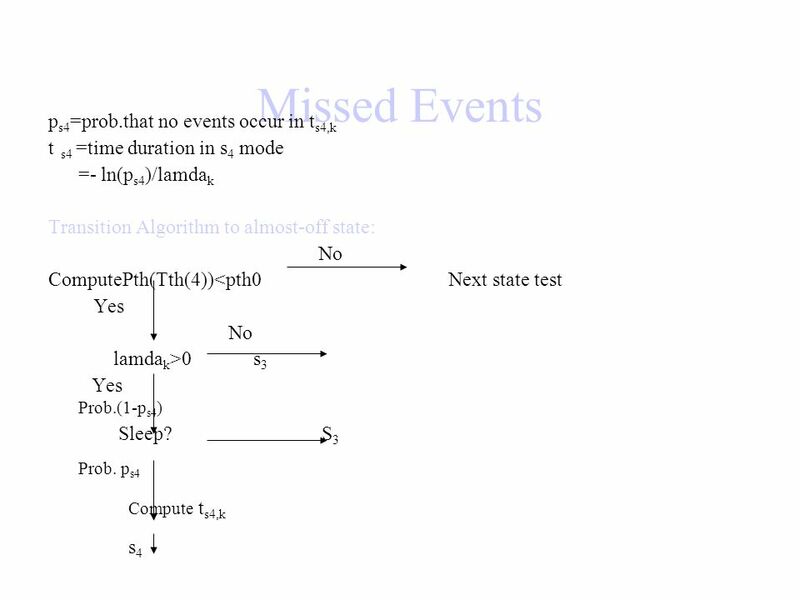 Either at initialization or after a topology-modifying event Level can vary depending on the network considered. 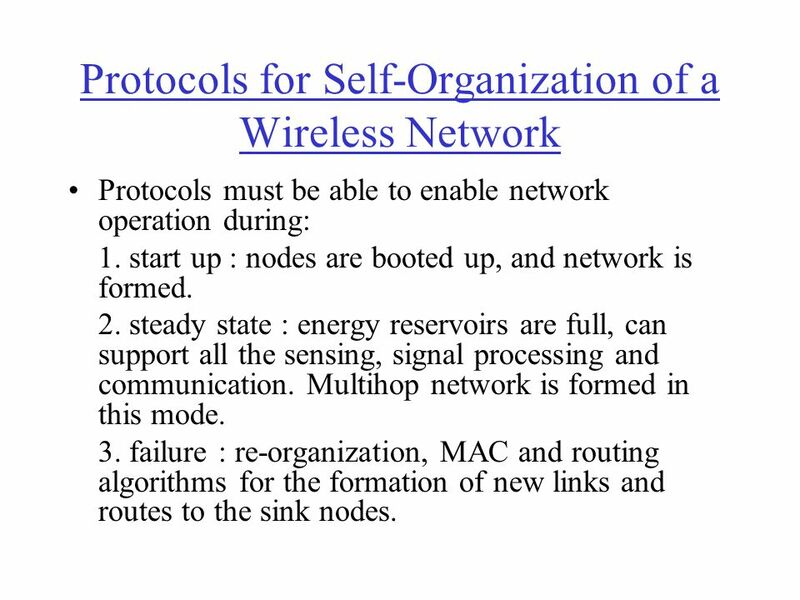 Protocols must be able to enable network operation during: 1. start up : nodes are booted up, and network is formed. 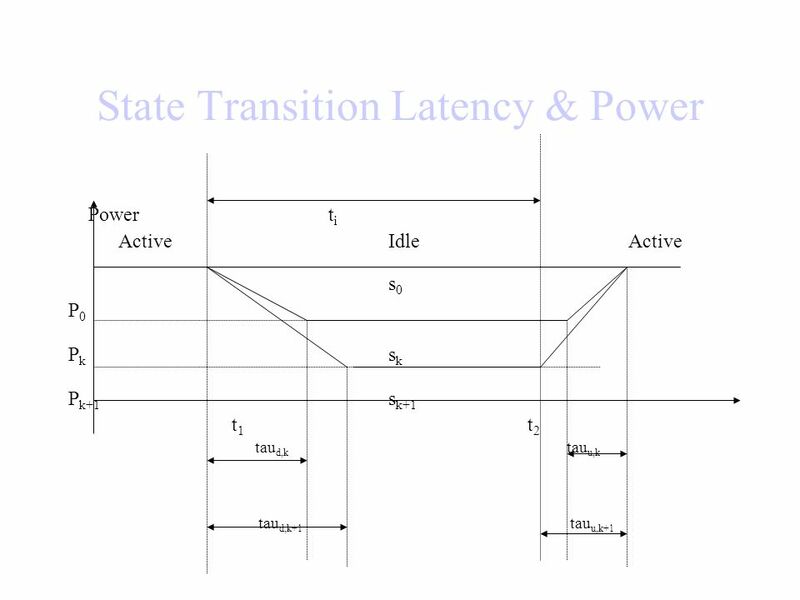 2. steady state : energy reservoirs are full, can support all the sensing, signal processing and communication. 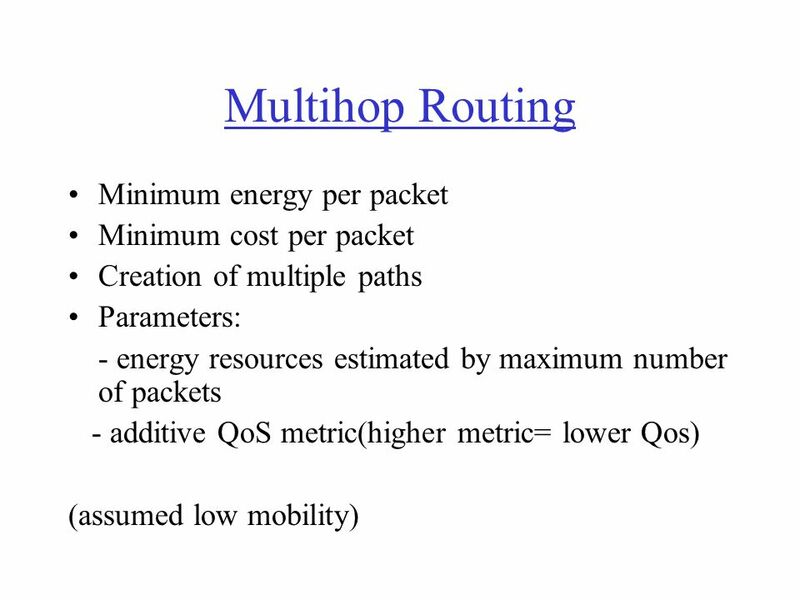 Multihop network is formed in this mode. 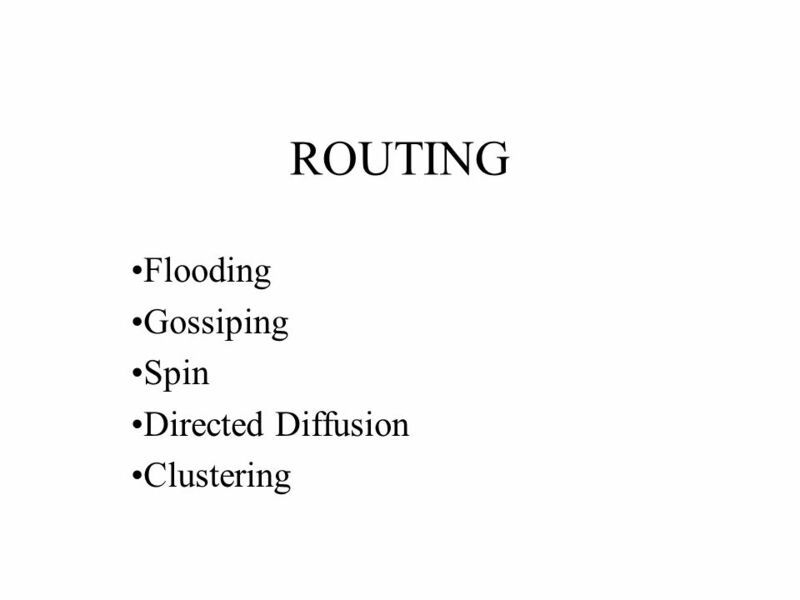 3. failure : re-organization, MAC and routing algorithms for the formation of new links and routes to the sink nodes. 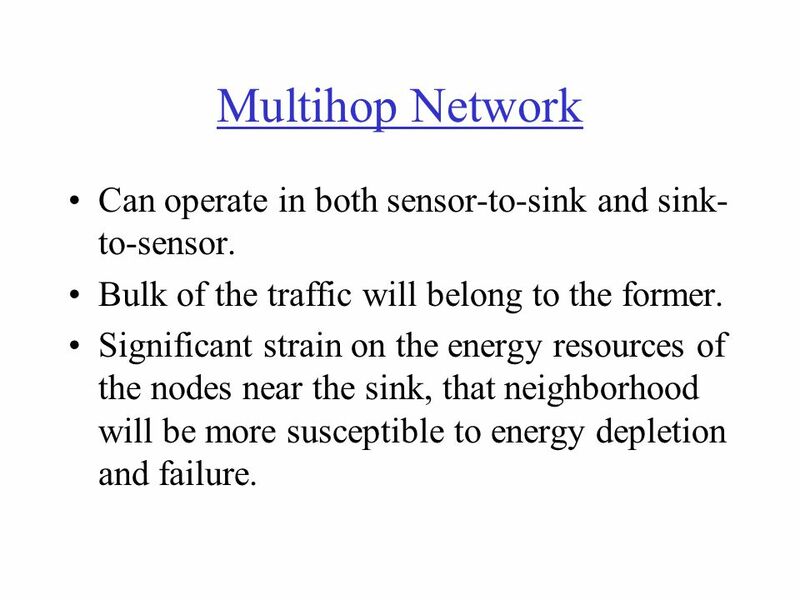 13 Multihop Network Can operate in both sensor-to-sink and sink-to-sensor. Bulk of the traffic will belong to the former. 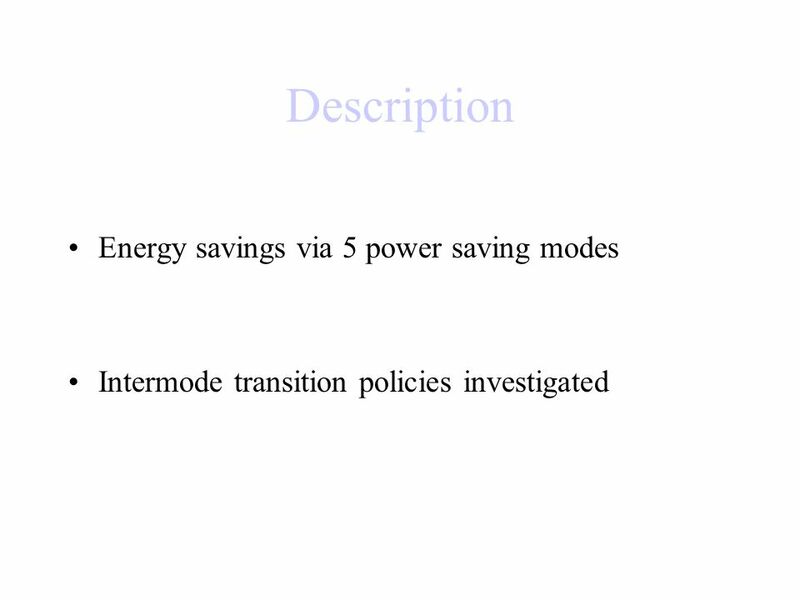 Significant strain on the energy resources of the nodes near the sink, that neighborhood will be more susceptible to energy depletion and failure. 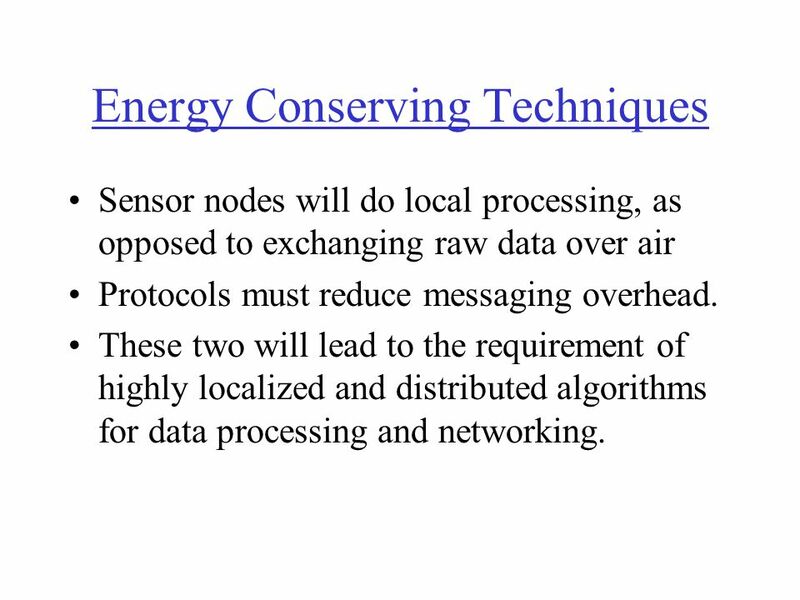 Sensor nodes will do local processing, as opposed to exchanging raw data over air Protocols must reduce messaging overhead. These two will lead to the requirement of highly localized and distributed algorithms for data processing and networking. 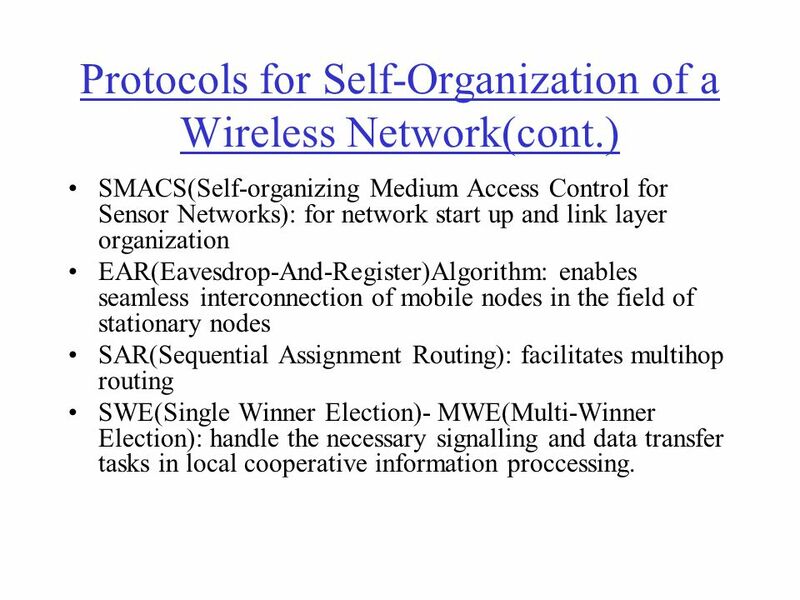 SMACS(Self-organizing Medium Access Control for Sensor Networks): for network start up and link layer organization EAR(Eavesdrop-And-Register)Algorithm: enables seamless interconnection of mobile nodes in the field of stationary nodes SAR(Sequential Assignment Routing): facilitates multihop routing SWE(Single Winner Election)- MWE(Multi-Winner Election): handle the necessary signalling and data transfer tasks in local cooperative information proccessing. Offers continuous service to the mobile nodes under both mobile and stationary constraints. 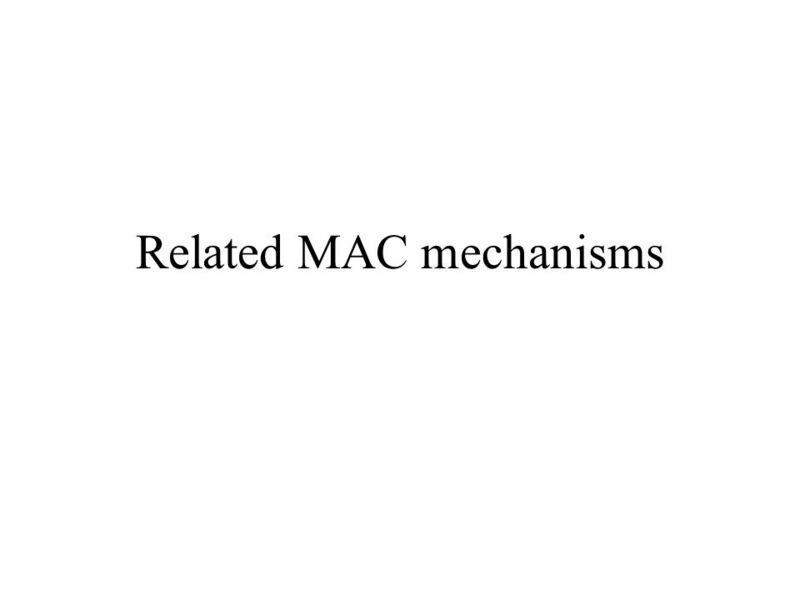 Primary constraint: battery power; mobile and stationary sensors must be established with as few messages transmitted by stationary sensors as possible. Hand off may not be required. 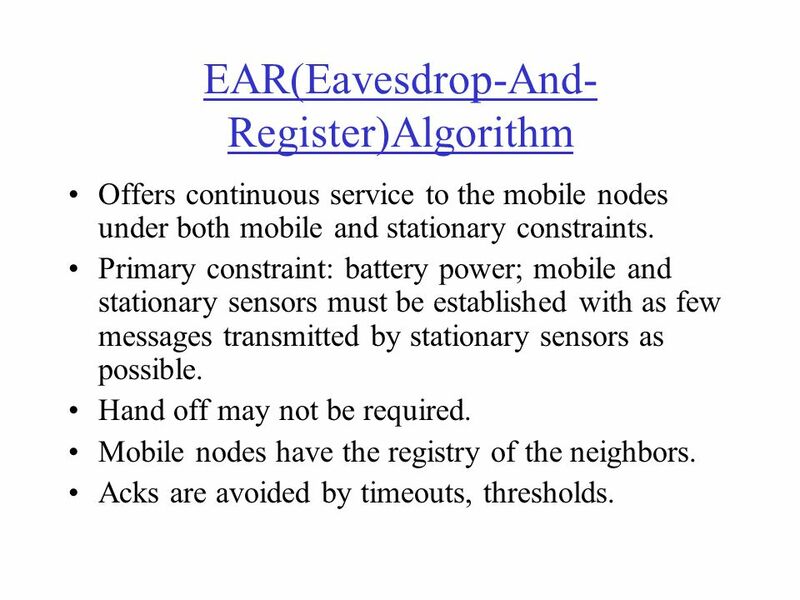 Mobile nodes have the registry of the neighbors. 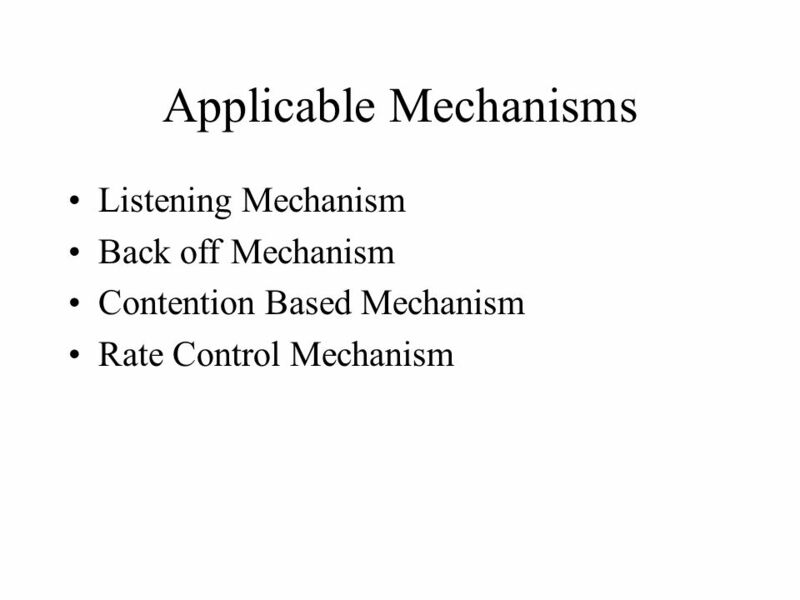 Acks are avoided by timeouts, thresholds. 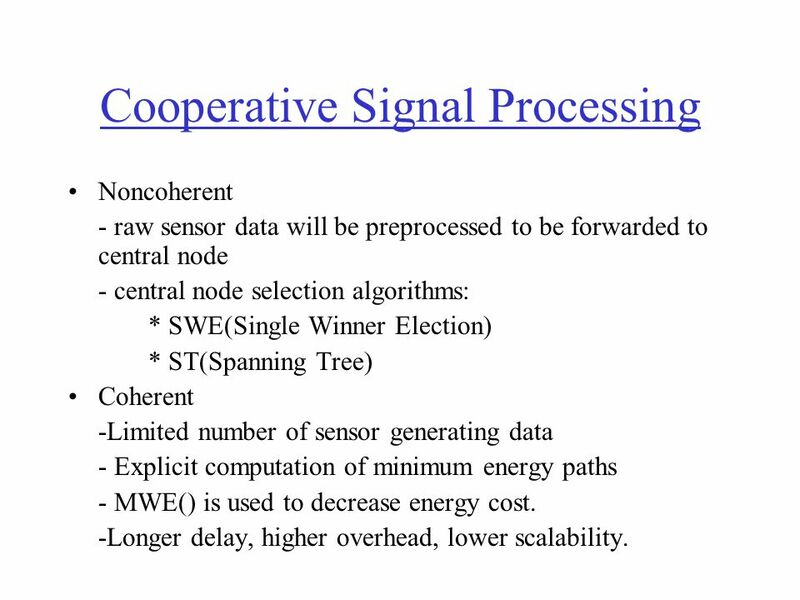 Noncoherent - raw sensor data will be preprocessed to be forwarded to central node - central node selection algorithms: * SWE(Single Winner Election) * ST(Spanning Tree) Coherent -Limited number of sensor generating data - Explicit computation of minimum energy paths - MWE() is used to decrease energy cost. -Longer delay, higher overhead, lower scalability. 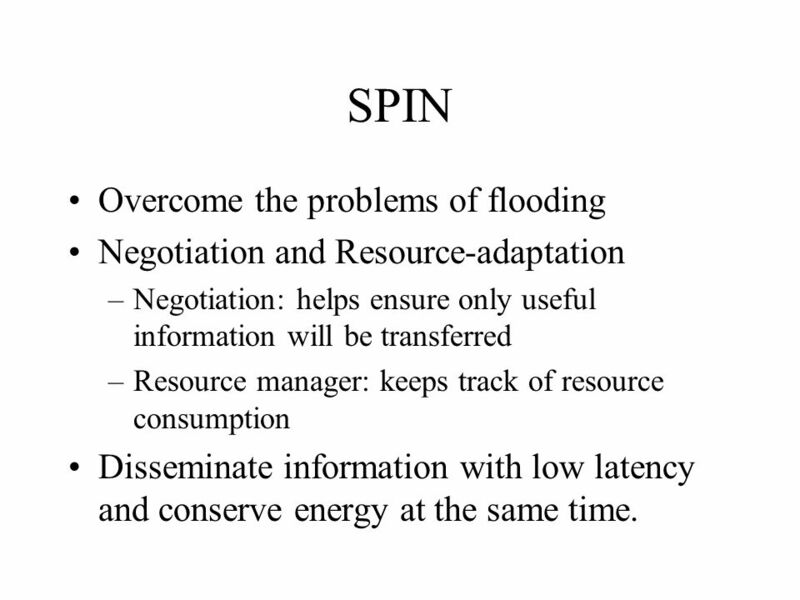 Negotiation and Resource-adaptation Negotiation: helps ensure only useful information will be transferred Resource manager: keeps track of resource consumption Disseminate information with low latency and conserve energy at the same time. 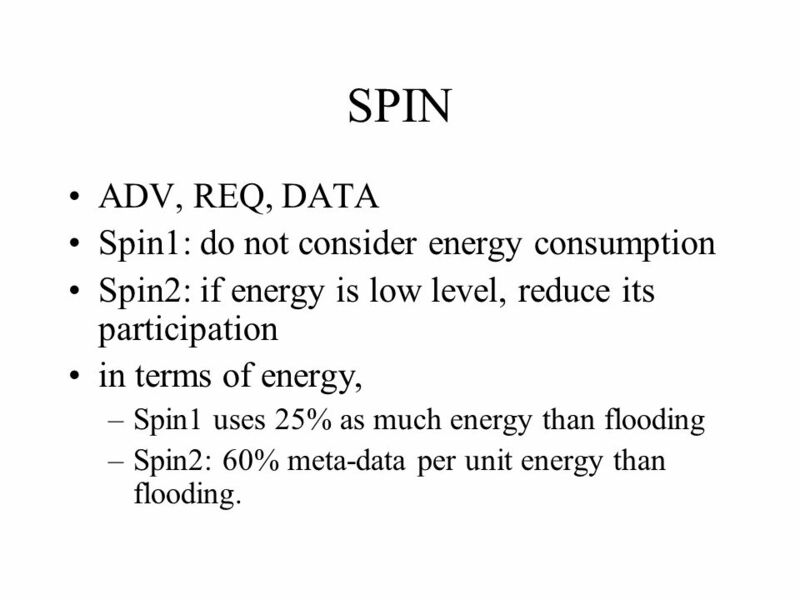 Spin2: if energy is low level, reduce its participation in terms of energy, Spin1 uses 25% as much energy than flooding Spin2: 60% meta-data per unit energy than flooding. 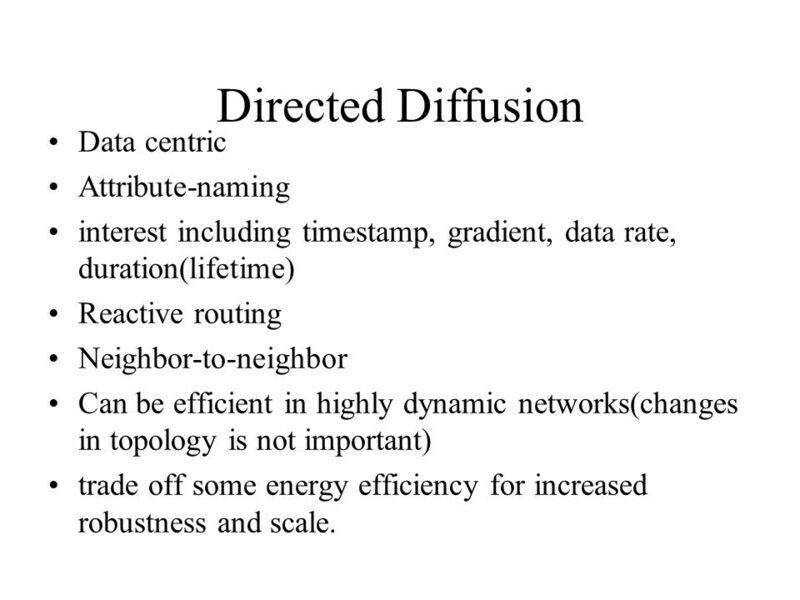 interest including timestamp, gradient, data rate, duration(lifetime) Reactive routing Neighbor-to-neighbor Can be efficient in highly dynamic networks(changes in topology is not important) trade off some energy efficiency for increased robustness and scale. 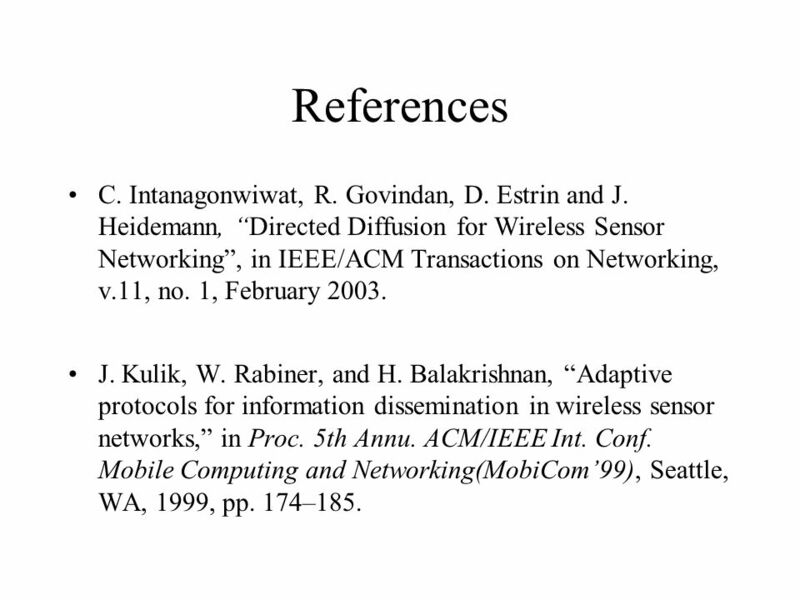 31 References C. Intanagonwiwat, R. Govindan, D. Estrin and J. Heidemann, “Directed Diffusion for Wireless Sensor Networking”, in IEEE/ACM Transactions on Networking, v.11, no. 1, February 2003. 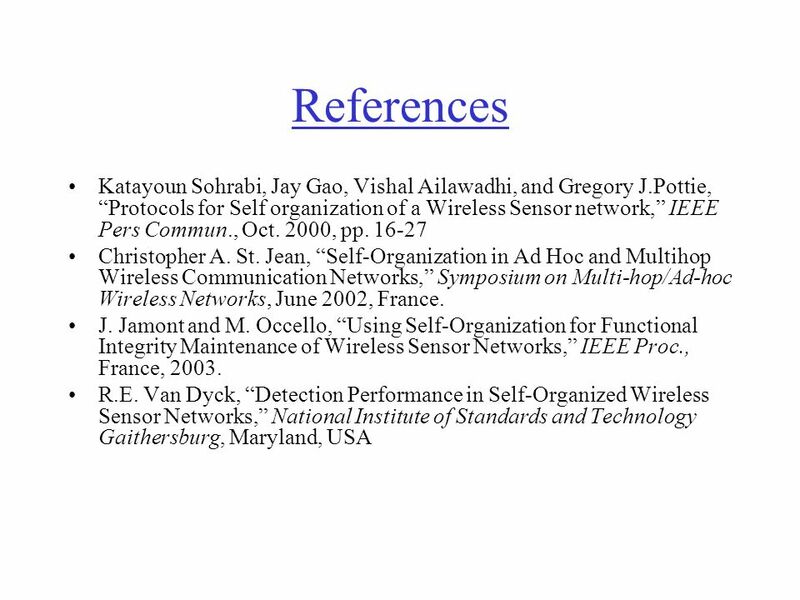 J. Kulik, W. Rabiner, and H. Balakrishnan, “Adaptive protocols for information dissemination in wireless sensor networks,” in Proc. 5th Annu. 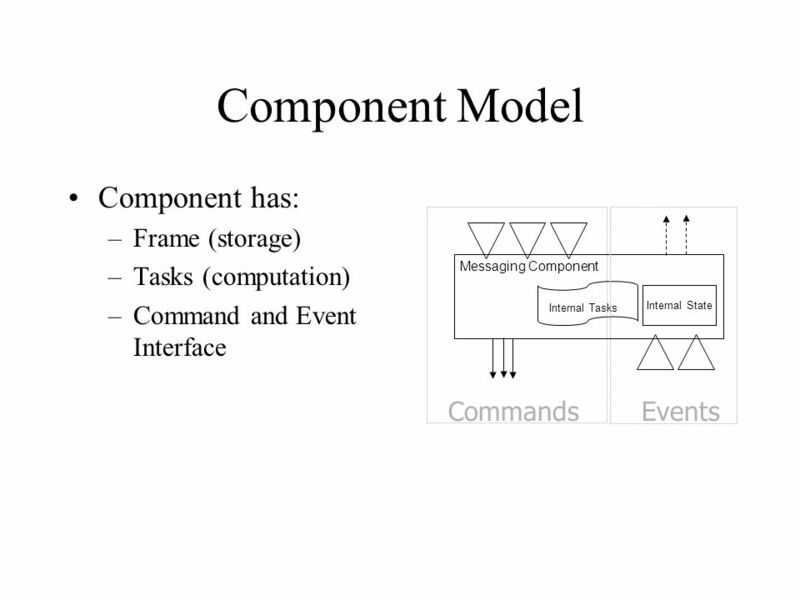 ACM/IEEE Int. Conf. 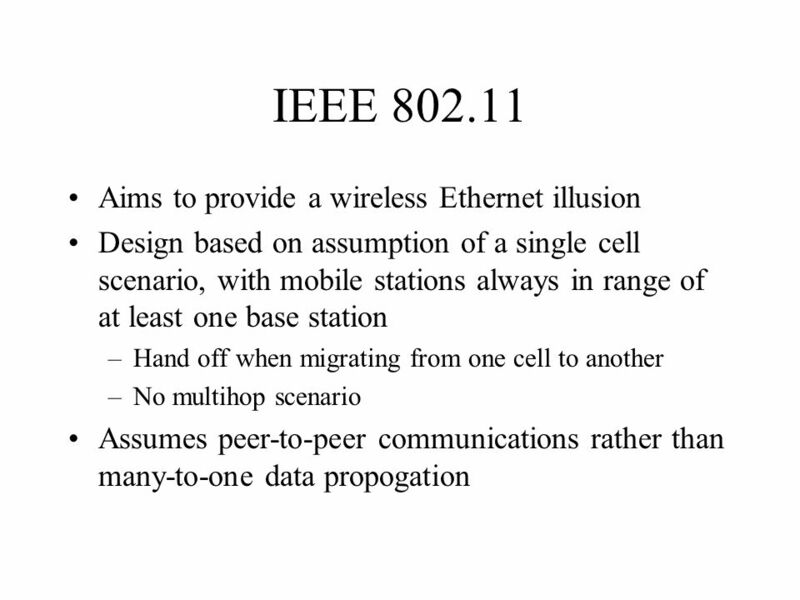 Mobile Computing and Networking(MobiCom’99), Seattle, WA, 1999, pp. 174–185. 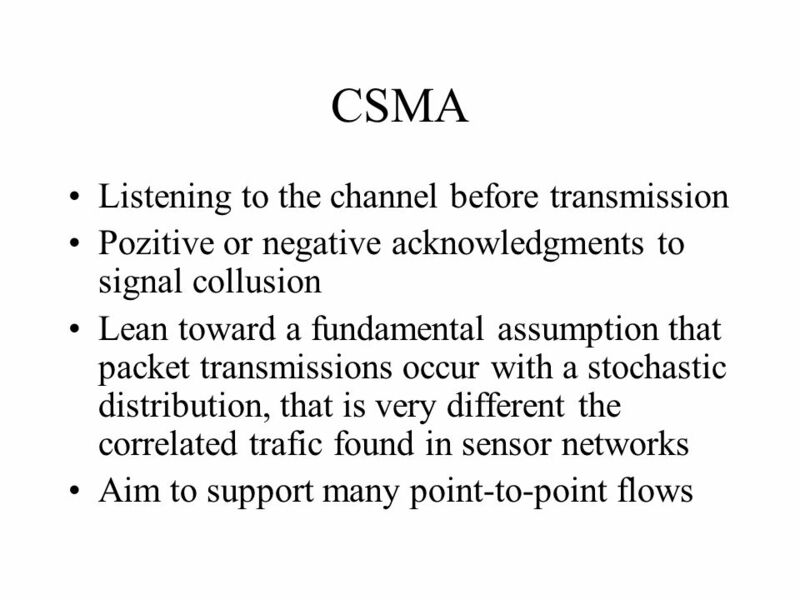 SELF-ORGANIZING MEDIA ACCESS MECHANISM OF A WIRELESS SENSOR NETWORK AHM QUAMRUZZAMAN. 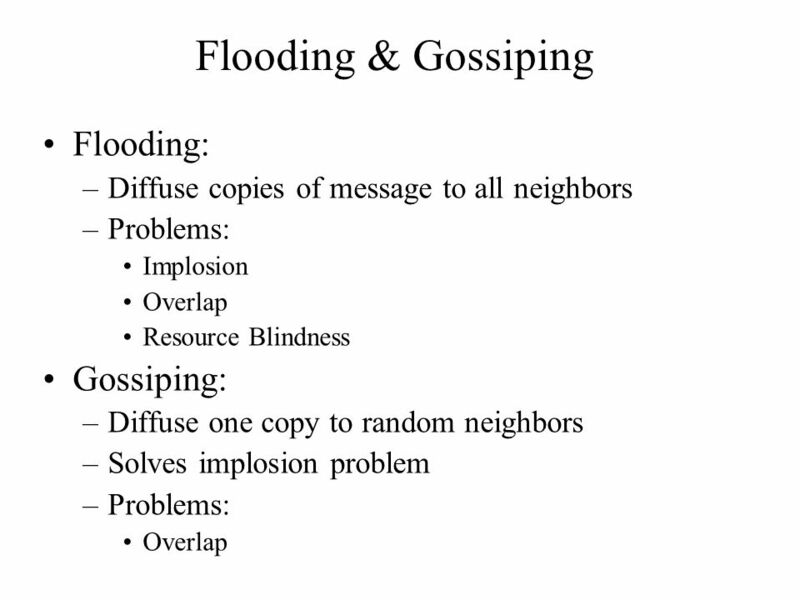 Decentralized Reactive Clustering in Sensor Networks Yingyue Xu April 26, 2015. 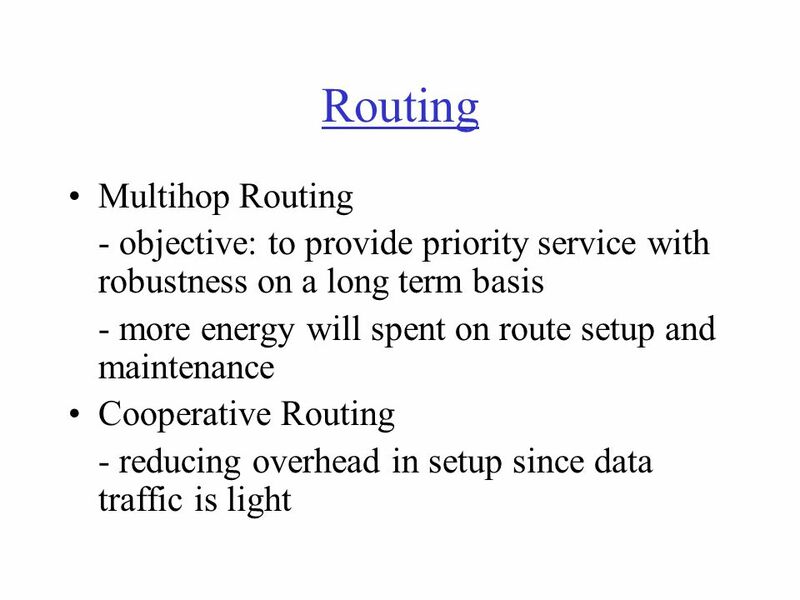 Routing Protocols for Sensor Networks Presented by Siva Desaraju Computer Science WMU An Application Specific Protocol Architecture for Wireless Microsensor. 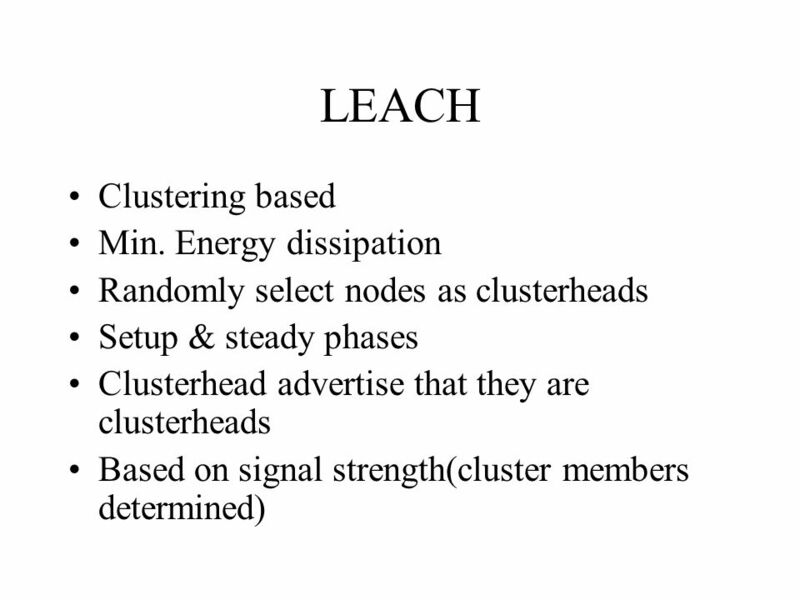 Sensor network Routing protocol A study on LEACH protocol and how to improve it. 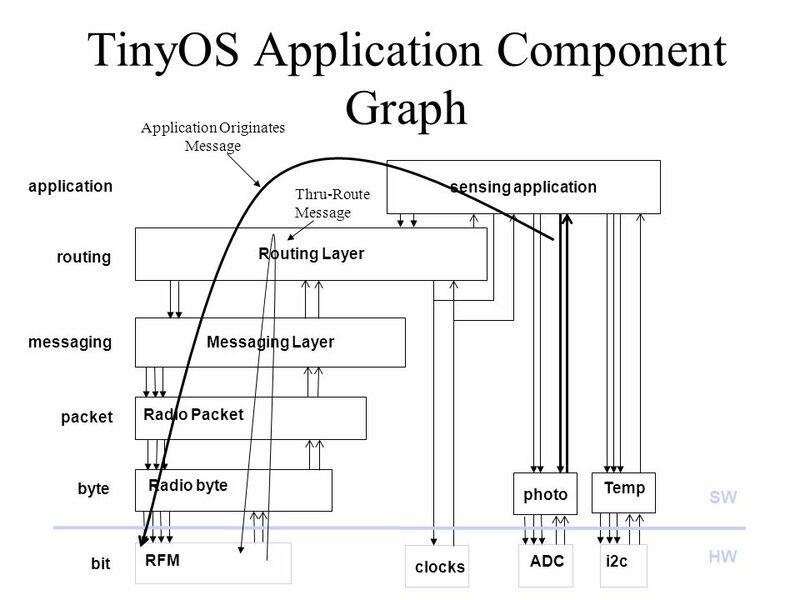 Sensor Networks Tiny sensor nodes, typically wireless capable of data sensing, processing and communications. Deployment in inaccessible terrains or disaster. Supervised by professor: Ivan Stojmenovic Done by: Yaser Fouad. 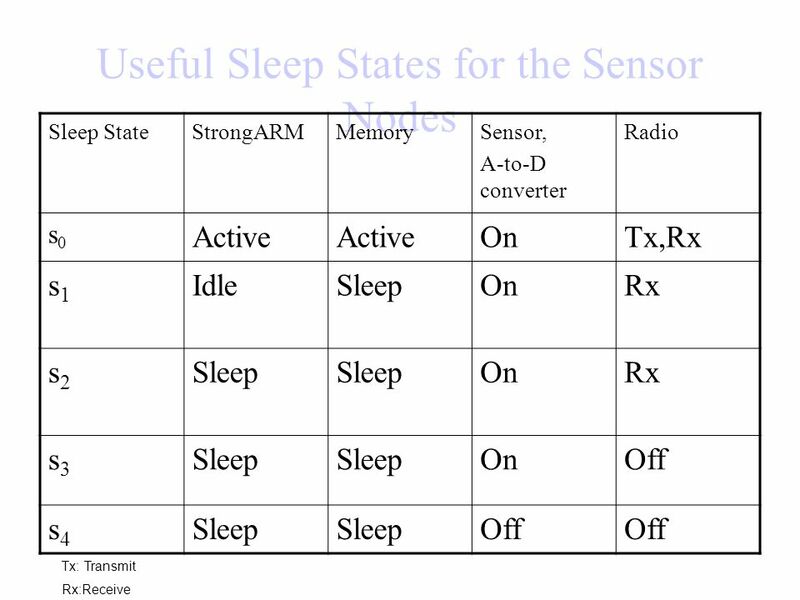 SENSOR NETWORKS ECE 654 Irene Ioannou. 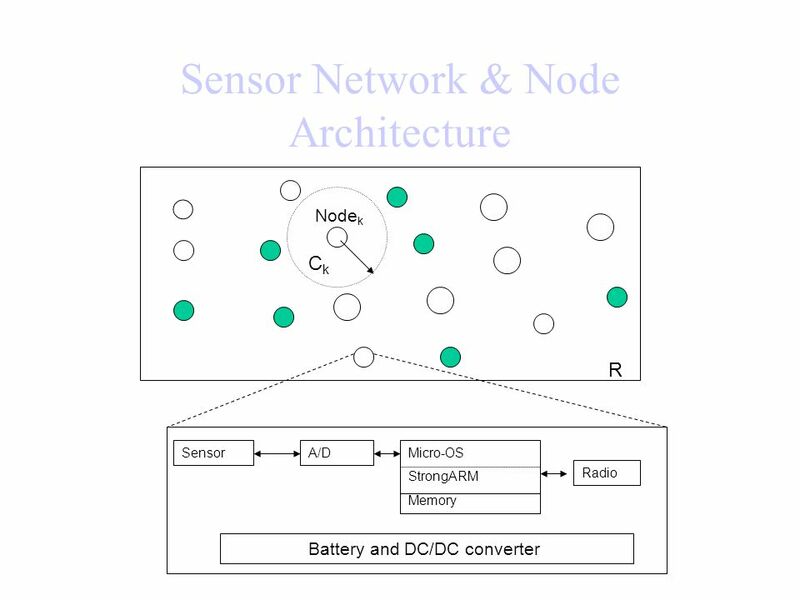 Sensor networks communication architecture. 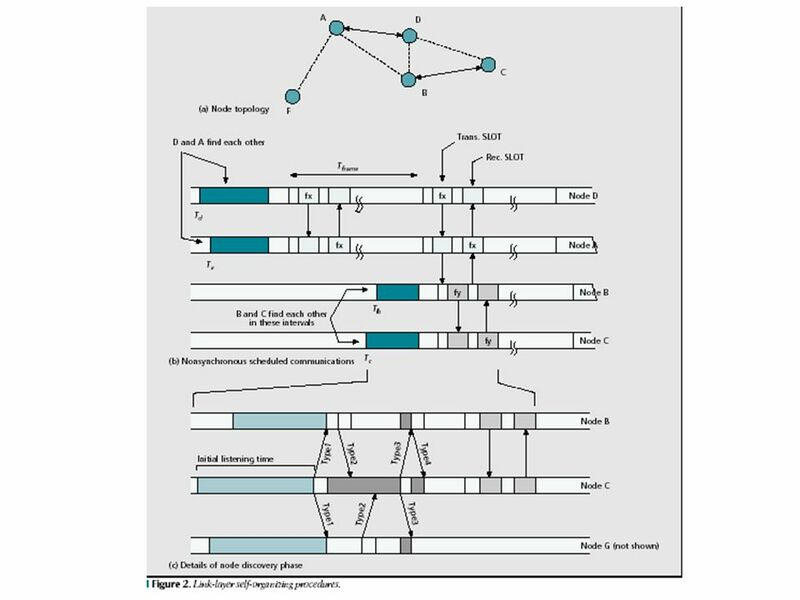 1 Routing Techniques in Wireless Sensor networks: A Survey. 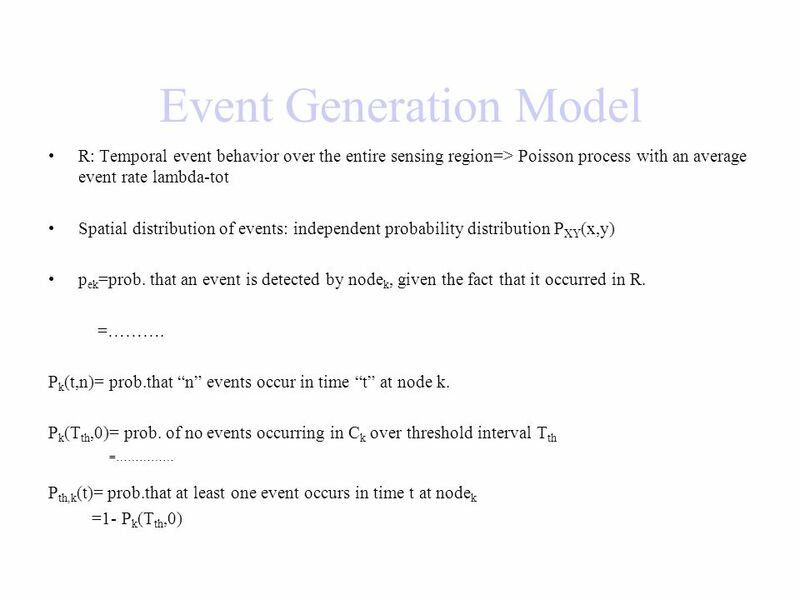 1 Next Century Challenges: Scalable Coordination in sensor Networks MOBICOMM (1999) Deborah Estrin, Ramesh Govindan, John Heidemann, Satish Kumar Presented. 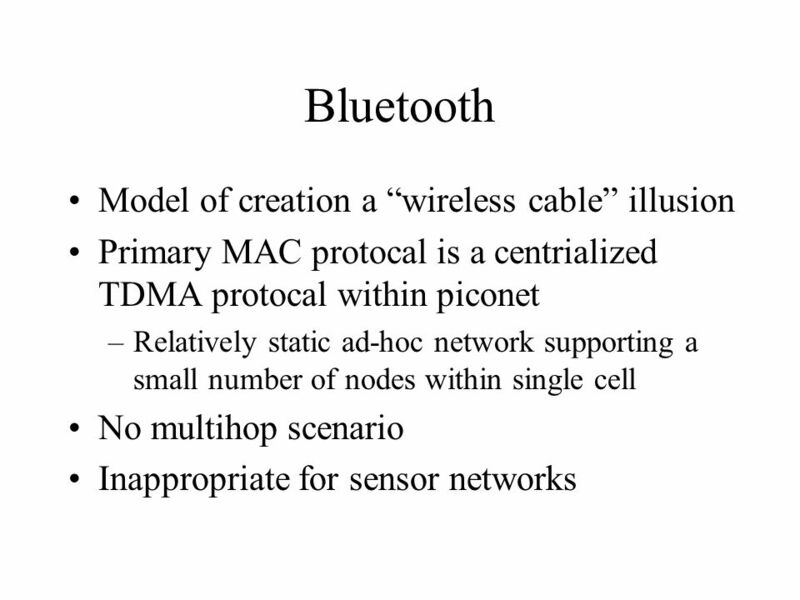 Wireless sensor networks: a survey 周紹恩 指導教授 : 柯開維 1. 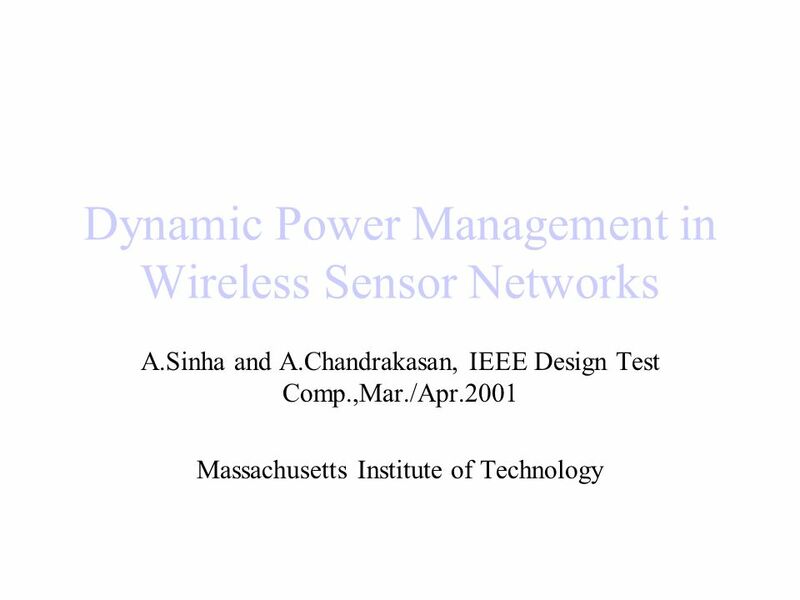 PEDS September 18, 2006 Power Efficient System for Sensor Networks1 S. Coleri, A. Puri and P. Varaiya UC Berkeley Eighth IEEE International Symposium on. 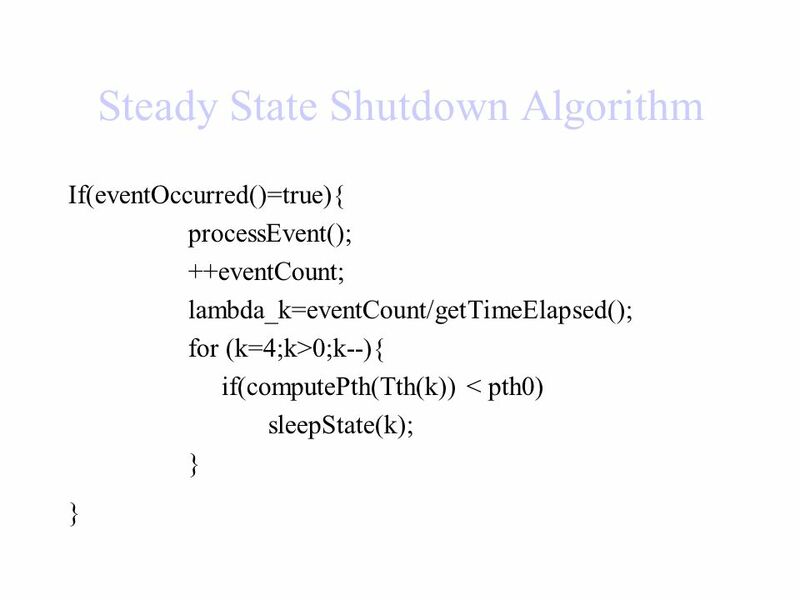 1 Cross-Layer Scheduling for Power Efficiency in Wireless Sensor Networks Mihail L. Sichitiu Department of Electrical and Computer Engineering North Carolina. 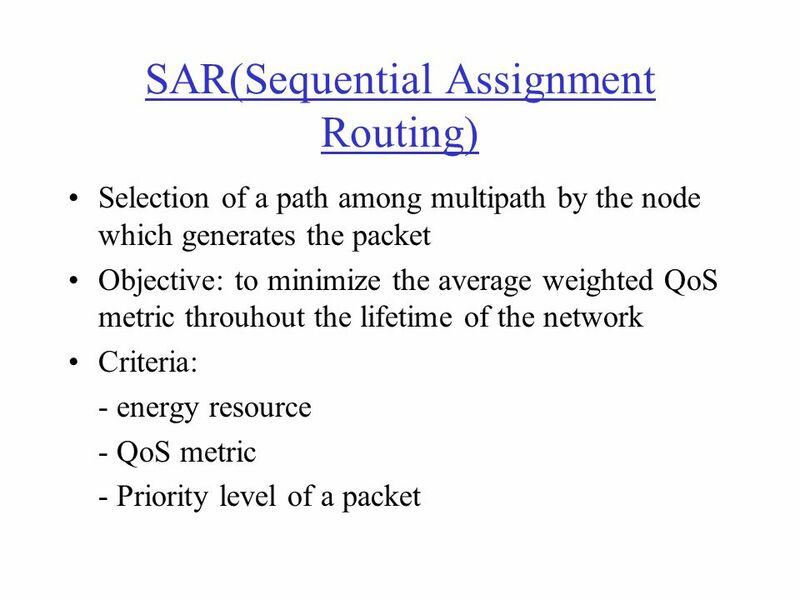 1 On Handling QoS Traffic in Wireless Sensor Networks 吳勇慶. UNIT IV INFRASTRUCTURE ESTABLISHMENT. INTRODUCTION When a sensor network is first activated, various tasks must be performed to establish the necessary.